How did former state superintendent Tony Bennett lift not only Christel House Academy’s state A-F grade, but more than 160 Indiana schools’ performance ratings as well? We explain the ‘subscore ceiling,’ and how lifting that ceiling impacted many schools’ grades. So how did we do our calculation? We’ll get to that below. But first, we need to explain two things: How exactly does the A-F grading system work? And what exactly did Bennett do when he asked his staff to change it? 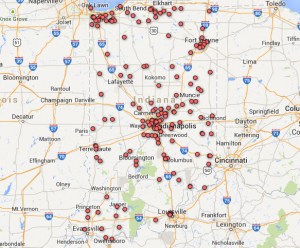 Click here to view a map of 165 schools whose grades improved because of a change former state superintendent Tony Bennett's staff made to Indiana's A-F grading system. How Do Schools Get Their Grades? Indiana bases its letter grades for elementary and middle schools on standardized test scores. A school’s grade comes from two sets of ISTEP+ scores: its English Language Arts numbers and its math numbers. Think of it like a GPA, except for a school. For both math and English, schools get 4 points for A-level scores, 3 points for B-level scores, and so on. There’s a twist. Under Indiana’s model, schools can also earn up to 2 bonus points in each subject for showing academic growth among students. So while schools are graded on a 4-point scale, they can earn a subscore of up to 6 points in both math and English. The school’s final grade comes from averaging the math and English subscores. But there’s one more twist. When Indiana officials conceived the A-F system, they wanted to avoid a situation where a school could get a great subscore in one subject and a middling subscore in the other subject and still get an “A.” By their reasoning, an A school should be excellent at both English and math. So they imposed something called a “subscore ceiling.” Schools could still earn their 2 bonus points in math and English. But when it came time to compute a final letter grade, their subscores in each subject maxed out at 4 points each. This policy was laid out in an Indiana Department of Education document dated March 26, 2012. Six months later, it came time to actually run the numbers and compute the school grades. This is when Bennett and his staff began emailing about how to change the computations in a way that would raise the grade of Christel House Academy, a charter school founded by a prominent Republican donor. The Associated Press published those emails last month. As The New America Foundation’s Anne Hyslop has written, state officials were able to increase the school’s grade by exploiting a “loophole” in the calculation guidelines that allowed them to disregard the school’s “terrible” high school scores. That was only enough to bump the school’s grade from a C to a B. If the ceiling remained in place, the school would have only earned a B, as School Matters’ Steve Hinnefeld has pointed out. Then, five days after Gubera’s email, a new document explaining the Department’s calculation methodology appeared online. The subscore ceiling was gone. It’s not clear whether state officials lifted the subscore ceiling exclusively because they wanted to boost Christel House Academy’s grade. Whatever their reasoning, the change had a statistical ripple effect, according to StateImpact’s calculations. Not only did Christel House’s grade go up, but so did the grades of 165 other schools. Why Would Schools’ Grades Go Up? Here’s why. Without a subscore ceiling, some schools that had received the bonus points began getting subscores much higher than 4. Schools were banking math or English scores of 4.5, 5 or 6 and counting them toward their final grade. Consider a school that earned 2 points in English, but earned 6 points in math. With a ceiling in place, the school couldn’t take credit for its bonus points in math. So its final score, calculated by taking the average of 2 and 4, would be a 3. That’s a B. But with no ceiling in place, that same school can take credit for its bonus points. Its final score — now the average of 2 and 6 — is 4 points. That’s an A. How Did We Find The 165 Schools With Higher Grades? We know the A-F grades that schools received last year. We have them in a handy StateImpact table right here. And the detailed scoring data showing English and math subscores is available to download from the DOE’s website. Next, in a spreadsheet, we essentially re-imposed the subscore ceiling onto the final grades. This allowed us to see how many schools’ final grades changed as a result of the change in the A-F grading formula. First, we sorted the spreadsheet by math subscores to identify schools that had math subscores higher than 4. We replaced those numbers with a 4 — that’s the subscore they would’ve had under the ceiling scenario. Next, we did the same for English subscores. By our count, 165 elementary and middle schools saw better grades as a result of the changes. Most of these schools saw their grades increase from Bs to As. A few others saw their grades increase from Cs to Bs. Before we posted these calculations, we asked Hinnefeld, Hyslop and the IU Center for Evaluation and Education Policy’s Terry Spradlin for help in checking our facts and double-checking our math. Check out our resources on Indiana’s A-F grading system. We explain how it works in this video and we also explain how it’s changing in this video.